With another cowardly beheading of Steven Sotloff and taunts against the US, the evidence is clear and we must lead the civilized world to take overwhelming action against the evil barbarians. Start by focusing on Algeria (the al qaeda / ISIS of its time). Open to other nations to join such as Spain and England. Each member will contribute by reasonable proportion. Members may contribute in money or weapons rather than ships (as Japan and others did during the Gulf War). Once Algeria is “reduced to peace” the coalition will focus on the other states. 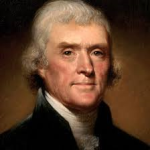 While financial and political issues at home dictated that we paid tribute for several years until the Barbary War during Jefferson’s presidency, this is another case of the founders dealing with and anticipating consequences. Jefferson knew these Islamic terrorists, like ISIS had to be forced into submission. The founders knew appeasement would only encourage them and didn’t want one country to bear too much of the military or financial burden of destroying them. They also understood that monetary contributions were as important as the military hardware and personnel. As we pointed out in The New Founders, we must learn from the founders; for they addressed all the issues we face today. While times have changed, righteous principles, human nature and evil have not. This entry was posted on September 4, 2014 at 12:18 pm and is filed under al qaeda, Barbary Pirates, Founders, Government, ISIS, Islamic Terrorists, Justice, National Security, Obama, terrorism, terrorist, The New Founders, We Win America. You can follow any responses to this entry through the RSS 2.0 feed.